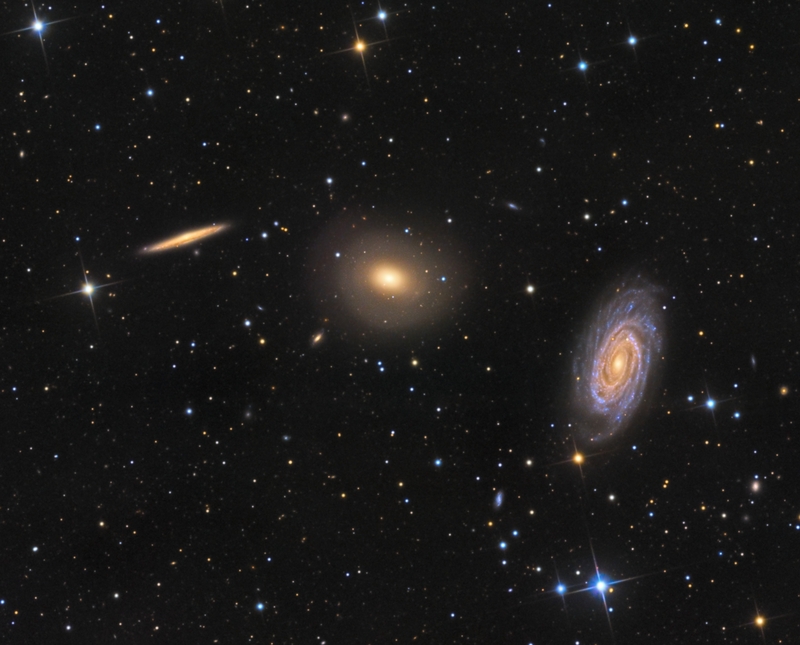 Explanation: This intriguing trio of galaxies is sometimes called the Draco Group, located in the northern constellation of (you guessed it) Draco. From left to right are edge-on spiral NGC 5981, elliptical galaxy NGC 5982, and face-on spiral NGC 5985 -- all within this single telescopic field of view spanning a little more than half the width of the full moon. While the group is far too small to be a galaxy cluster and has not been catalogued as a compact group, these galaxies all do lie roughly 100 million light-years from planet Earth. On close examination with spectrographs, the bright core of the striking face-on spiral NGC 5985 shows prominent emission in specific wavelengths of light, prompting astronomers to classify it as a Seyfert, a type of active galaxy. Not as well known as other tight groupings of galaxies, the contrast in visual appearance makes this triplet an attractive subject for astrophotographers. This impressively deep exposure hints at faint, sharp-edged shells surrounding elliptical NGC 5982, evidence of past galactic mergers. It also reveals many even more distant background galaxies.